I have been scouring the net for months collecting as much info on Ropefish as I can find. I’m attempting a breeding project with them and I’m trying to write a very detailed paper. My question is about how they are collected in the wild. I’ve been trying to find someone to correspond with that has seen them collected or knows how they are collected and I really want to find pictures or better yet video of the habitat they are being pulled from. Also it would be nice to speak to someone about what the locals know about the fish and what they know about them breeding. I saw a post on here where Neale mentioned speaking to someone at Interzoo who was associated with their export from Nigeria and I would love more info on that. I really appreciate any help you can give or anyone else you might know that I can contact. Thank you so much. I know they have been bred a few times with the offspring making it about 18 weeks at the longest before dying of unknown causes. So I’m trying to figure out if simulating wet and dry season will help keep the offspring alive. I’m also trying to find any info I can on how they are collected because I feel like something that is happening when they are collected might be hurting our chances of tank breeding them. And I’m wondering if they have different techniques in different areas where they are caught. Similar to how some fish are sedated for shipping and thing like that having an impact. I appreciate your fast response and am excited to see if anyone else has any more info or a connection to someone with more info I can talk too. That actually helped a lot. I really do think that the dry season in particular must have the most to do with fry survival. I have added a “turtle” dock to my set up and covered it with moss. I have observed them leaving the water onto the dock and eating terrestrial insects offered on the dock such as wingless fruit flies. I also have “jungle” style plants that allow the ropes to rest at the surface by sitting on the plants trying my hardest to simulate the reedy swamp like condition of their natural environment. I really am having a hard time finding video or pictures of them in the wild and also finding the “poison” used to catch them and exploring if that is discouraging tank breeding. I’ve been doing a lot of research on the ecology of the fish and find that some of the studies on locomotion and oxygen intake done in the 80’s have been the most helpful. I had not however thought about the humid air they breath as fry might have something to do with the success rate. The only reason I say “poison” is because I don’t know what they are using. The only info I’ve gotten says they are collected by people using a fence like structure to fence off a reedy area and the “use a chemical to sedate or knock out” the fish so they can be easily collected. Any ideas on the exact way they collect this species. I finally found where they were taking about the wild catching on here and it was bob Fenner can you forward this convo onto him? Purchased a rope fish . Tropical fish established tank . Well fed of worms /shrimp. Looks like he hurt himself 3 places loss of scales . No white patches. Went back to purchase another rope for him preferably a female. Same store had them in a sick tank. I explained the situation and they offered an injury solution started with an "m"
i am to return tomorrow as the shipment would be In then . I have had reed fish in the past but never had any problems . I'm not convinced he rubbed against coral and scraped himself . Please lead me in the right direction . Thank you . Hi Mr. fenner.. I did read last night. Very insightful. He died in the night. Pet store was great . Local family owned . I asked if they could hold 2 and explained your advice upon your website . They were very understanding and asked for the link. Willing as well to reimburse another reed fish. Very thankful for your wisdom . In the mean time I am concerned he may have infected my violet goby. Should I treat the tank ? Also if yes what are your suggestions? I bought a rope about a week ago that was in a tank with large Oranda gold fish. I found this fish to be very interesting and since it was in a tank with gold fish, I bought it because that is what I have at home. I also bought an Oranda that was in the tank with him so he would have someone familiar. so I bought 10 feeder guppy's for him. In two days 8 were gone. 2 remained for almost a week. I started to worry that he was not eating. 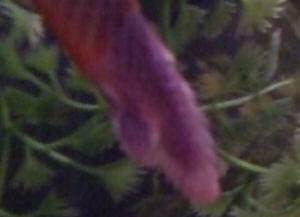 Then I noticed my Oranda's left fin was tore up like it was nipped at. The store told me it could have been the rope. This makes no sense to me because there were still 2 tiny feeder guppy's. Well, the Oranda's fin began to get infected so I quarantined her. I later read that ropes like to be in groups and tend to eat better that way. I went back to purchase another and they had just got a shipment in. I had two choices, a larger rope that flipped and flopped everywhere or the smaller rope that seemed calmer. The store also recommended me to stop giving guppy's and make them adjust to shrimp pellets. I added the new rope and he didn't really swim around like my first did in his introduction but, I gave him the benefit of trying to figure the new home. By the morning I saw that he found the cave he chose and one of the two guppy's were gone. Don't know which one ate it but was glad to see one eat regardless but still concerned of eating habit because 1) I don't know if they are really eating the pellets and 2) It has been 4 days since the second rope was added and all four days he stayed in his cave; even at night-I check several times. Today he came out but swims weird. He will position his body vertically with head down and spin in circles while staying straight and vertical. By the evening he is now floating at the top of the tank with his body in a circle and floating in a circle. there is still one guppy there and I don't know if they are eating at all and don't know if they are really eating the shrimp pellets plus my gold fish try to eat the pellets even when I shut the light off at night. Is the second rope sick or is that just his personality and how long do they go without eating? My tank is a 65 gallon breeder with two power filters that each filters up to 70 gallons. Nitrates and nitrites are good and yes even with my gold fish the ammonia is maintained with chips and remover and test shows safe and the ph is 7.0. I have inspected everyone's body and fins, everyone looks good except the Oranda which is quarantined and being treated and yesterday one of my black moors had the same fin problem so he is with the Oranda now getting treated before his infection could even get started. I read the ropes like to bundle together and they don't even go near each other. Any thoughts, comments, suggestions and advice. the Oranda is about 4, 2 black moors are 3in, and one fancy tail is 2 and 1/2, the other fancy is 1 and 1/2, and 3 comets are 2in. You are probably thinking this is too many fish but these fish look tiny compared the this tank and the 65 breeder is just a temp home and looking to get a tank over 100 gallons maybe 200 to accommodate the ropes adult size and the 3 comets were for my uncles tank but when I brought them I did not add them to his tank because his current one fish had slim and sickness all over it so I placed them in mine till his gets better. Oh yea, I had a snail but he disappeared today, can't even find the shell. I recently purchased two Reed fish as company for my existing Reed fish who has been living quite happily in my community tank for about 6 months. I did this because I found out that apparently Reed fish prefer company. Oliver(the name of the first Reed fish) is apparently a hermit amongst his species, well he doesn't seem to like the other two new Reed fish, the tank has plenty of hidey holes for all fish so they could have 1 each if desired, but it would seem that Oliver is destined never to get along with the new ones. Has it been your experience that you really need to buy the Reed fish from the same stock for them all to get along, or is it a case of just leaving them to it. It looks quite viscous when they are fighting, but none of the fish have any signs of damage on their body's and all of their scales are fine. I have another tank which will be ready for fish in the next few days and was wondering if I would be best leaving Oliver as a single Reed fish, whilst moving the two new ones to the new tank as they do not seem to have a problem with each other. Other than that they seem to be happy fish, unless swimming past each other. My Ropefish lost his nostrils!! 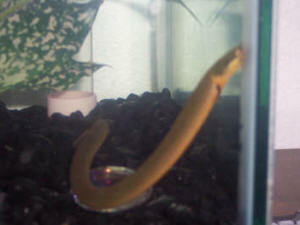 2/3/06 I have had my Ropefish for about 4 years now. He/she has been great. A couple of weeks ago his tank mates (an Oscar and large Pleco) died of I'm not sure what. He seemed fine until his nose got very red and raw. It went from red, to white, and then to normal. The only thing is his nostrils are gone!! will they ever grow back? Thanks for any help. >> Likely you had high ammonia, which killed your other fish, and burned the nostrils off your rope fish. They will grow back. Ropefish Hi my name is Crystal and I hope you can answer my question. My brother has 2 Ropefish, 1 is a couple of months old the other he just got about a week or 2 ago. The one that he just recently got is lying on his back... he/she is still breathing but just lying there. could you possibly be able to tell us what is going on?? <These fish can have difficulties resulting from their capture, shipping... Best to leave them at the store for a good week or two before buying...> The store he had got him/her from told me to get him to put aquarium salt in the tank because he/she might be having digestive problems. But this person said they knew quite a bit about Ropefish but doesn't know to much about their anatomy's because according to him the only time a fish would be on their backs and still alive is if they have a bladder infection and he doesn't know if that could be a possibility for Ropefish or not because he doesn't know if they have a bladder. <They and their relatives, the Bichirs do... it is connected to the throat, and ventral to the esophagus... Please see here: http://www.wetwebmedia.com/FWSubWebIndex/polypterids.htm> so I thought you could help me on this problem and I really really hope so. <Do check on continuing water quality... the behavior of lying on their back is not good. Bob Fenner> Thank you for your time.